Her students think so too. Listen to Mary Cook’s story, and you’ll see why. 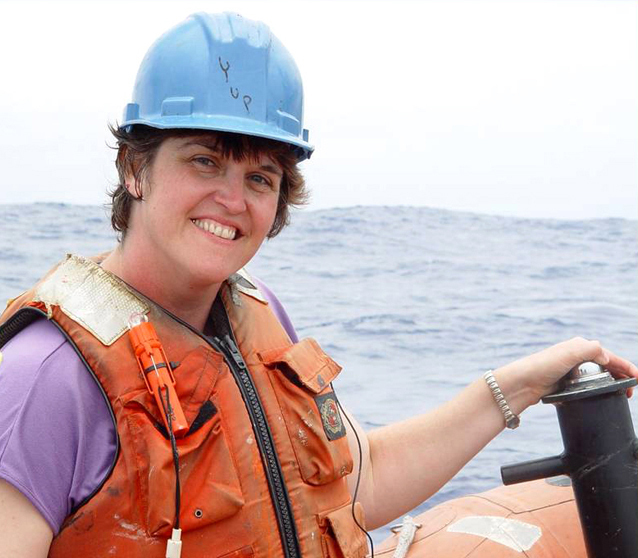 Mary Cook onboard the R/V Ronald H. Brown. 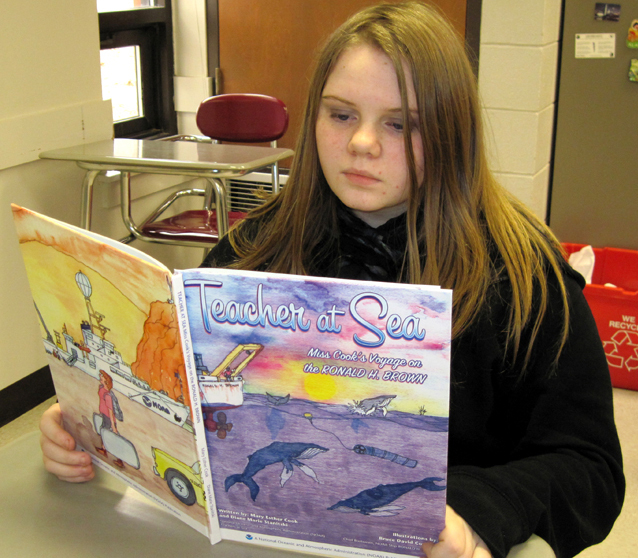 8th grader Emily Rollins reads the book that her teacher Mary Cook co-authored about her time at sea. Credit: Mary Cook. 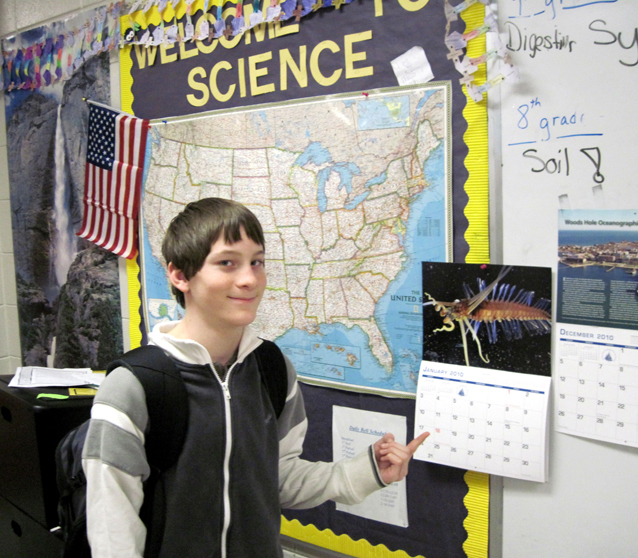 8th grader Brett Bolasco points out one of the sea creatures on display in Mary Cook's science classroom. Credit: Mary Cook. 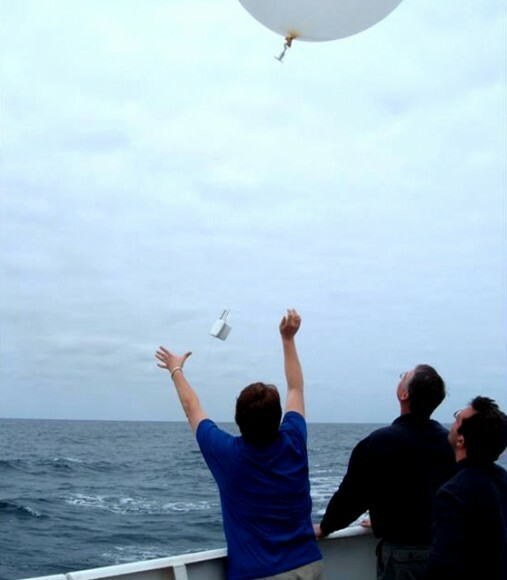 Science teacher Mary Cook releases a weather balloon during a research cruise as part of NOAA's Teacher at Sea program. Mary Cook's time on the water was turned into a children's book, filled with science, great prose, and beautiful illustrations. 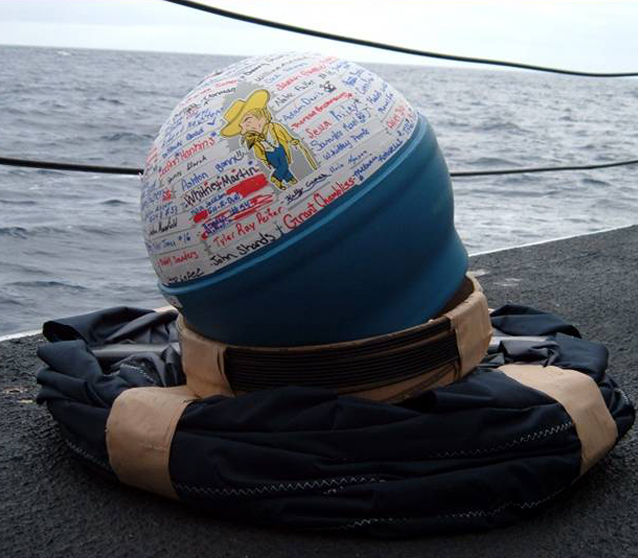 Bob the student-decorated drifter buoy awaits his deployment. finding us on Facebook by clicking here! I really enjoyed this podcast. 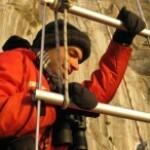 What an opportunity – I am so jealous! Hi Gordon, Thanks!! I’m glad you enjoyed the podcast. It was a great opportunity serving as a NOAA Teacher at Sea—- a wonderful program for any teacher. I’m proud of my students for their enthusiasm about the ocean. They are so energetic and insightful! Have a great day! Hi Mary, Wow! What a great podcast. You made me feel as if we were on the ship again, especially the reminder of how the ocean seems to breathe. It was a privilege to work with you on board the NOAA Ship Ronald H. Brown, and it’s terrific hearing how your students were impacted by your experience. Keep up the great work, and let’s go to sea again!! Hey Diane! Great to hear from you. Thank you for your comments. 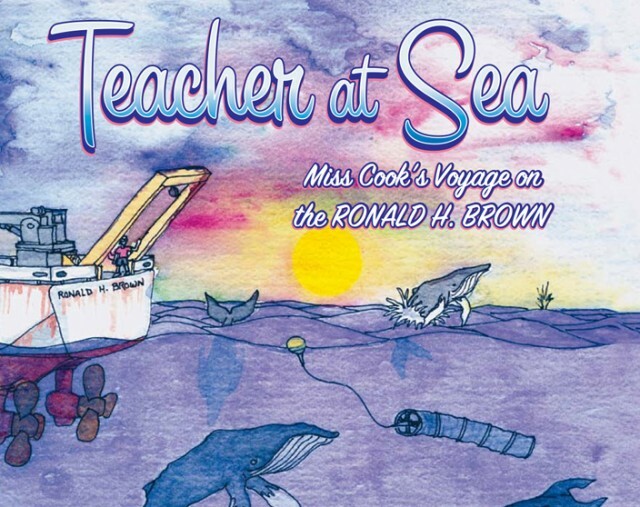 You being my mentor and co-author while aboard the Ronald H. Brown was a huge reason for the success of my Teacher at Sea cruise and all the “after” works, including the WHOI workshop and continued Adopt a Drifter efforts. You may not realize it but your oceanic and atmospheric work is continuing to have a positive effect on 100s of kids. Thank you for being a friend and a great mentor. Thank you for sharing such an inspirational story, and I really loved Mary’s comment about the ocean breathing.